killa hearts you: Long (lazy) weekend! yeah, i laid in bed and watched tv... for 99% of the weekend (the other 1% spent having a nice lunch/suit shopping adventure downtown, thanks Mr). geez talk about a waste of time and gray matter for the rest. 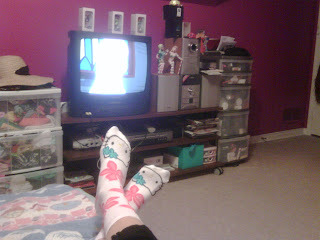 -my Fafi dolls are around the tv and on my stereo. the big ones keep falling and breaking though. they've both lost their lollipops and popsicles. tragic. -i don't even want to get into how much junk food i eat when i am left to my own devices. -my million year old bedspread. yes, there are geese on it. i hate geese. they are vicious! mostly the Canadian ones. i don't ever mess around with them. EVER. i saw one in the Square One parking lot once and walked the other way. seriously. so... that is a semi tour of my room. forget the closet and underwear drawers. that would take too long. i saw a geese/goose whatever nesting in a winners parking lot. just sitting there. i was almost tempted to pull over and try to take its pic but then i was afraid of getting pecked to death. don't worry...this weekend we are going out. don't diss me for 12 year olds!